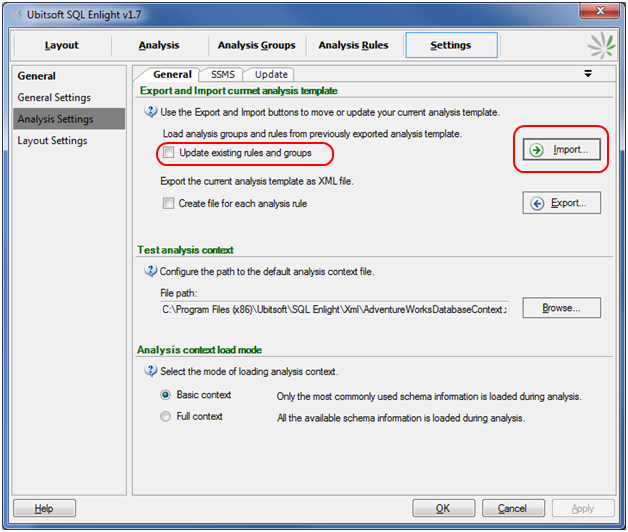 The SQL Enlight analysis templates are XML files that contain analysis rules and analysis groups definitions. The templates can be imported in SQL Enlight and this way can update or add new rules to the currently supported set of rules. 3. Backup of your existing template using the Export button. Completely Import and replace the active analysis template with the imported one. To use this option, unselect the Update existing rules and groups check box. Import all new rules and update existing rules from the new template, and preserve the rules in the active template that do not exists in the new template. This option is suitable in the cases when you have custom rules (with names different than the ones in the new template ) that you want to preserve. To use this option, make sure that Update existing rules and groups check box is selected.